Lotus Wei is a wonderfully creative and intelligent flower remedy company developed by flower essence expert Katie Hess. Katie has trained with international flower essence practitioners and studied meditation and mindful awareness techniques with several Tibetan Buddhist masters, including The Dalai Lama, The Karmapa — Tibet’s next generation leader — and Ayang Rinpoche, a master of compassionate death and dying. Flower essences that have the ability to transform your life and uplift your entire well being. Lotus Wei's collection of elixirs, serums, mists, perfumes, and delicious dark chocolates, are all infused with a combination of nature’s purest medicines—flower essences and essential oils. Using these healing plants, founder Katie Hess has created six blended mood-enhancing formulas— Inspired, Infinite Love, Quiet Mind, Pure Energy, Inner Peace and Joy Juice. Each one is specifically formulated and completely unique in its ability to excite profound and lasting inner change. Dr. Edward Bach is considered the grandfather of flower remedies, and Katie Hess speaks to an audience that is urban, busy and open-minded. She makes it simple for anyone to use and understand flower essences, pinpointing just what type of essence you need can be difficult, Katie makes locating your ideal healing combination fun and playful. To find your perfect essence, Lotus Wei asks you to intuitionally choose three flowers from a colorful graphic display of a variety of blooms. Your choice, based on which flowers most attracted you, will ultimately reveal your most important remedies. How does it work? Well, how did indigenous peoples know to heal themselves with local plants and herbs? The answer is simple—they sensed it. Katie Hess is a flower alchemist and the founder of Lotus Wei, one of the world’s leading floral apothecaries. Throughout Kate’s decade of experience in healing she has seen the results of this potent medicine speak for itself over and over again. My own experience with choosing flower essences was very enlightening. I was really happy with the flower remedies that were chosen. After four weeks of using QUITE MIND, INSPIRED ACTION, and INFINITE LOVE, I had experienced a uplifting shift in mood. I was smiling a lot more, I spoke with increased clarity and I sensed a deepening of inner peace that made me feel safe and grounded. Flower essences, whether taken internally or applied externally, have immediately positive effects on your mood and state of mind. Different from essential oils, they do not have a scent, but work through the body’s acupuncture meridians. Used over time, they revitalize the body, accelerate personal growth, and eliminate non-constructive patterns. Flower essences are fast-acting, have no side effects, and are the most sustainable form of natural medicine on earth. They help people get to know themselves on a deeper level, catalyzing profound personal transformation. Katie Hess's latest project included collaborating with renowned photographer and cinematographer Louie Schwarzberg, who shoots exquisite and unique footage of flowers, landscapes, and people. 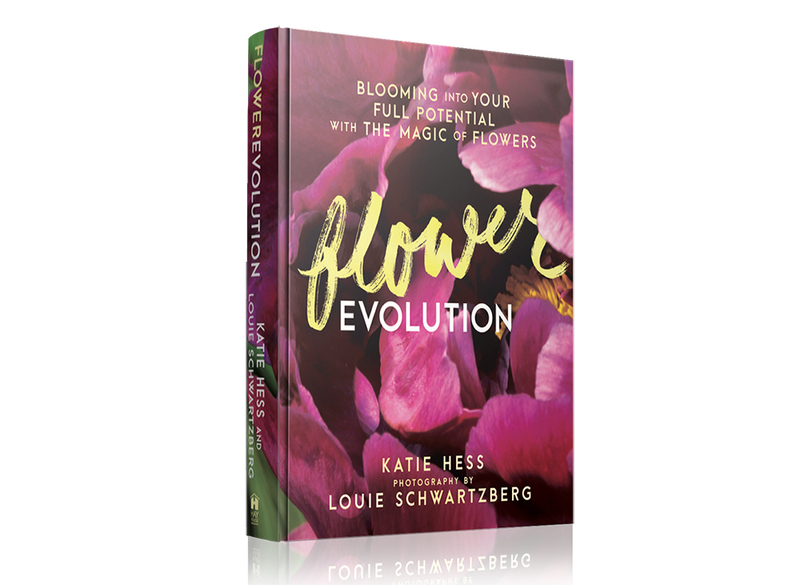 Flower Evolution is a book about stories, reflections, and rituals designed to wake up your connection with flowers, trees, yourself, and your loved ones. It offers a powerful way to experience a heightened interconnectedness with everything around you. Using flowers as teachers, you will discover how to accelerate your personal growth and delve into new insights about yourself every day through flowers.